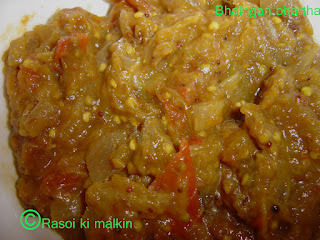 Microwave the brinjals for 20-30 mins in a Microwave safe plate. Let it cool. Now peel off the skin of brinjal. And mix the brinjal to paste with hand or spatula. Now take a pan, add oil, after oil is hot add the seasoning items, and ginger garlic paste to it. Fry for 2-3 mins and add onion to it. Saute until they are translucent. Now add tomatoes and cook until it becomes soft and oil gets seperated from tomatoes. Now add the cooked brinjal to the pan. Now add spices like Red Mirch powder, Dania Powder, and Garam masala powder, Salt. Cook for 5-10 mins on medium heat and switch it off. You can enjoy this curry with Roti's/ Rice. It will be yummy with Roti's.